I was going to title this piece ‘a better way of doing things’ and then I stopped because I wasn’t sure that what we did at the weekend was ‘better’, but it was ‘different’ and it was certainly very enjoyable. What was it that we did? Well…..
Hilary Jennings finally got to put her long-held plan of a Southside Players play in a weekend (that was also a new directors workshop) into action. We took the play ‘Two’ by Jim Cartwright – although it is designed for just two actors to play a huge number of parts, this means that each scene is a manageable duo-logue (or in some cases mostly monologue), making a collaborative approach easier in terms of logistics, style, continuity and story. A company of 20 people assembled, some would direct, some would act, some would do both, some parts were played by more than one person and some people played more than one part. Hilary had the joyful job of writing the schedule for this. Having done a basic readthrough on Wednesday and been allocated our parts and directors, on Saturday we met in the weird and wonderful ‘Shakespearian style globe Theatre’ of the Bedford pub. We sat in a circle and we talked – we did a lot of this -it was a good thing – we found out, that we all knew a lot more than we thought we did, that we had a wide range of expertise and that the individual view point of experiencing something (as an actor or a director) was just as valid as a system or method that required training and practice. We started off talking about warm-ups, why we do them, whether we should do them, what works, what doesn’t, why they need to be adapted to the type of play you are doing, the kind of cast you have, and the point you are in the process – a rehearsal warm-up and a pre-show warm-up might be very different. Then we did some warm ups! My favourite was (I think) called House. People are grouped in differently numbered groups around a circle (two people in one place, three in another, five in another) – these are the houses – a big group is a big house, a small one is a flat. The homeless person has to go round to each of these houses and ask to be let in – they can do this in any style, the houses then reject them and tell them to move on mimicking the style they have been asked in – so far so good. At any point someone in a house can decide to ‘move house’ they do this by running to one of the other houses – each house must only ever have the right number of people in it so everyone starts to run – the person left without a house at the end is the new homeless person – repeat until you all fall on the floor from exhaustion/laughing too much. We then looked at ways of looking at text. Again we had some general discussions, how you might mark the actual text to make it easier, how you might analyse it for the verbal structure, how you might analyse it in the context of the play. We did some interesting exercises with a piece of text from the play and looked at all sorts of ways of finding meaning, relationship, physicality – to be honest at one point we did start to make it up but that is the nature of the game anyway so we just went with this. We then sat around and I explained a bit about the ten steps for creating a character/analysing a play and that led to a discussion about different ‘methods’ and styles – ie not everything is Stanislavskian. 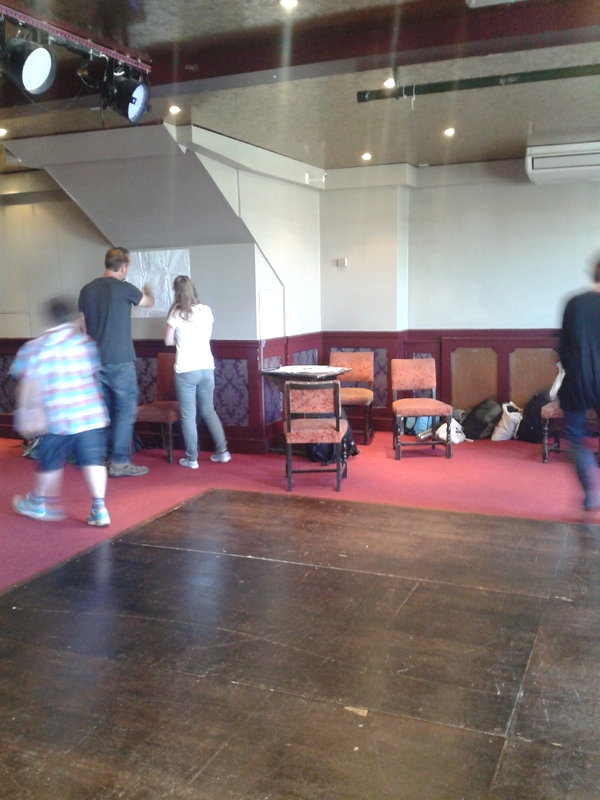 We then split off into our director/actor groups and did some work on our scenes. After lunch I did a short session on ‘objectless action’ as the play specifically states that all props are to be ‘mimed’. Then we did some more work on our scenes and those of us doing more than one thing did the other thing. At the end of the day we came together to agree things that needed a consensus – this was the most interesting bit, with eight directors and another 12 people involved you’d think this might be tricky. It took minutes. We had a flip chart sheet with the plan of the theatre on it. We decided where the street was, where the bar was, where the tv was, all the physcial context of the pub. We agreed the season. We agreed any other stuff that were required. We agreed the timetable for the next day. On Sunday we mostly just rehearsed the different parts, then did a run through and then did the performance. What struck me as so interesting and maybe ‘better’ was that in one room you could have two directors directing two different scenes and some actors running through stuff they’d already worked on. 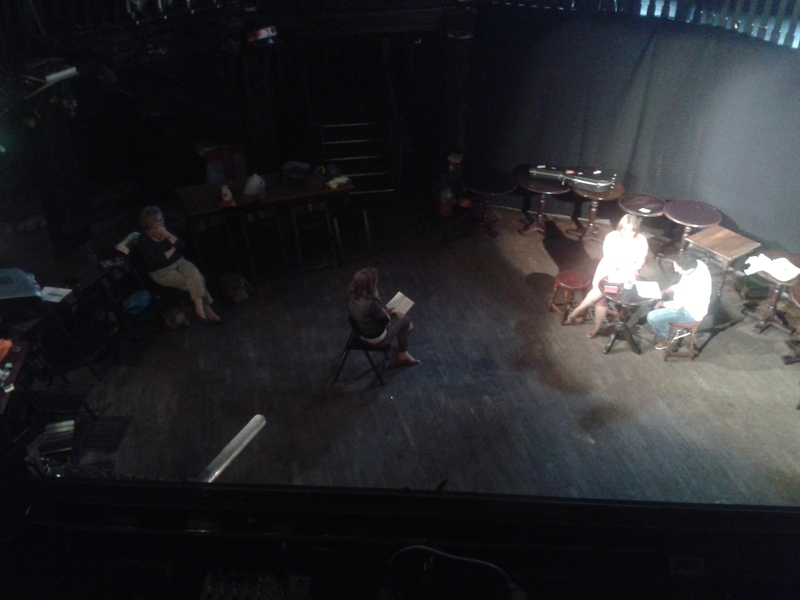 There was no tension, no huffing about ‘too loud’ or ‘in my space’ and it seemed (to me) some how more relaxed than a normal rehearsal – even though we were technically ‘up against the clock’. It felt like the divided attention actually allowed the actors to be freer, braver, and the divided responsibility of the directing also gave the directors breathing space. Often being part of a cast can feel great, like you’re part of a crack troop of soldiers, but being the director sets you apart, you’re the Captain, or the General and you have to take charge and ‘make it happen’. In our very communal set up, everyone was one of the troops. Because of the duplication of directing effort – we got so much more time – a play in a weekend – yes, but working 10 till 5 each day with an hour for lunch is only 12 hours. Take out all the workshops and discussions and its more like 5 hours of actual scene work. But times that by 8 and you have 20 hours of scene work (and it’s a short play) which is a big difference. So this made what might have been a mad-scramble into something that felt way more leisurely than the average rehearsal period for either am-dram or fringe (50-80 hours for am-dram and maybe 80-150 hours for fringe/low budget). And it worked, the performance worked, and people were happy. The audience, the directors, the actors. So happy that we all wanted to do it again. Or maybe try it on something more challenging, or in a different style, we started talking about plays that might work, and how collaboration is so much more enjoyable, interesting and rewarding than just doing your own thing. I suspect there will be more of this to come and it may be ‘better’ or it may just be ‘different’ – as long as we come out the end of it with something that people enjoy and find worthwhile it doesn’t really matter which.